The 2019 Nissan LEAF hums quietly along into the new model year. 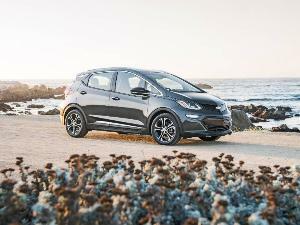 Following the debut of its second generation as a 2018 model, it remains a relatively affordable compact electric vehicle with a decent maximum range of 150 miles that’s probably enough to dispel the anxieties of most potential buyers. Using a fast-charging facility, a depleted Leaf can receive 88 miles’-worth of juice in 30 minutes. Otherwise, charge times for this lithium-ion battery can be 7.5 hours with a 240-volt supply, or as much as 35 hours using a domestic 115-volt setup. 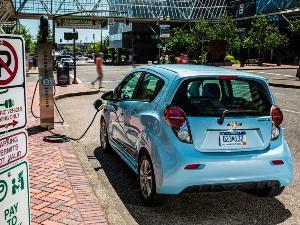 Electric vehicles are becoming more popular, but they still require a certain commitment. 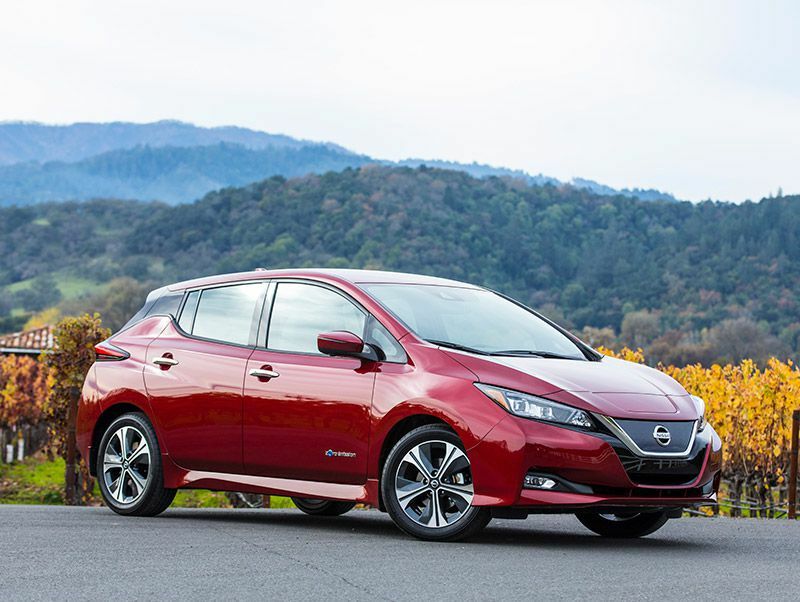 Let’s go into greater detail and see whether a new Nissan LEAF could be a good fit. 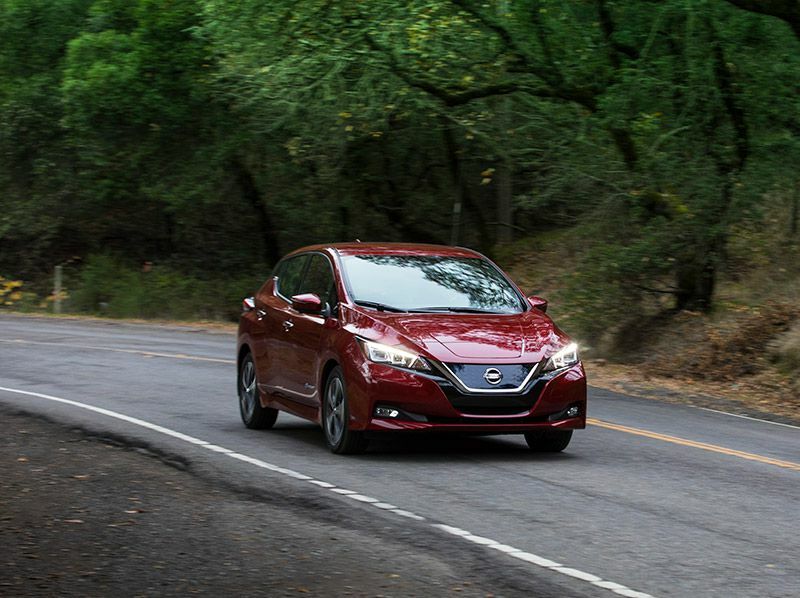 The 2019 Nissan LEAF starts with an S trim level, priced from $30,985 (including a $995 destination charge). The SV trim starts at $33,485, and the top-of-the-line SL comes in at $37,195. 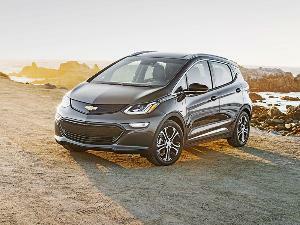 That is still less expensive than the 2019 Chevrolet Bolt EV’s starting price, although the Chevy has a range of 238 miles. A good thing about “alternative fuel” vehicles like these is that they qualify for a federal tax credit of up to $7,500, and there are various state incentives as well. Together, these could lop around $10,000 from the price. 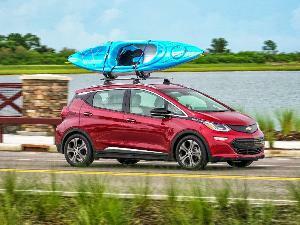 The Environmental Protection Agency estimated annual fuel costs for the 2018 Leaf at $600. The Leaf is available for sale in all 50 states. The S trim comes with automatic emergency braking, 16-inch steel wheels, power windows and locks, a six-way manually adjustable driver’s seat, a rearview camera, AM/FM/satellite radio, a CD player, a four-speaker audio setup, Bluetooth streaming audio, a USB port, and a 5-inch infotainment display. The SV is more attractive, with a 7-inch display, 17-inch alloy wheels, intelligent cruise control, six speakers, navigation, Bluetooth phone connectivity, Apple CarPlay/Android Auto, a remote charging feature, and several other desirable extras. The SL brings leather, heated front seats, an eight-way power-adjustable driver’s seat, a self-dimming rearview mirror, a 360-degree camera system, and a seven-speaker Bose audio upgrade. On the safety front, the SL has blind-spot monitoring with rear cross-traffic alert and driver-fatigue monitoring. The SV is eligible for more options than the S, allowing a buyer to cherry-pick some features that are standard in the SL, such as a heated steering wheel, garage door opener, and blind-spot monitoring. ProPilot Assist, Nissan’s “hands-on” driving assistant, is available in SV and SL trims. It maintains a safe distance to the vehicle in front (pre-set by the driver), keeps the car in the center of the lane, and can brake to a complete stop if necessary. The SV and SL may also be ordered with lane-keeping assistance and automatic emergency braking with pedestrian detection. The SL comes with a Level 1/Level 2 charging cable, which is optional in the other two trims. The cabin has some hard plastics, but the shapes and layout work as they should. It’s wonderfully quiet inside. Outward vision is well-considered. And there are several places to store small water bottles. A little more ergonomic effort would have been nice for the center armrest, though. It’s short and doesn’t slide forward and back. Since it’s fixed somewhat toward the rear, it could easily be a place that elbows knock against rather than lean on. While we’re complaining, in the SL version, the amplifier for the Bose audio system sits slightly proud of the loadspace floor and seems vulnerable if someone threw in a heavy object or two without really thinking. 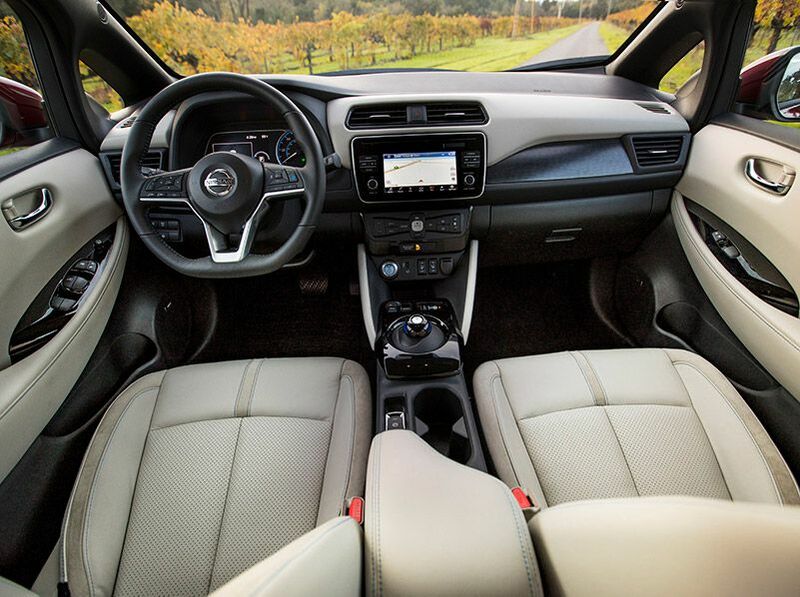 Otherwise, the Leaf’s interior should appeal to most buyers. 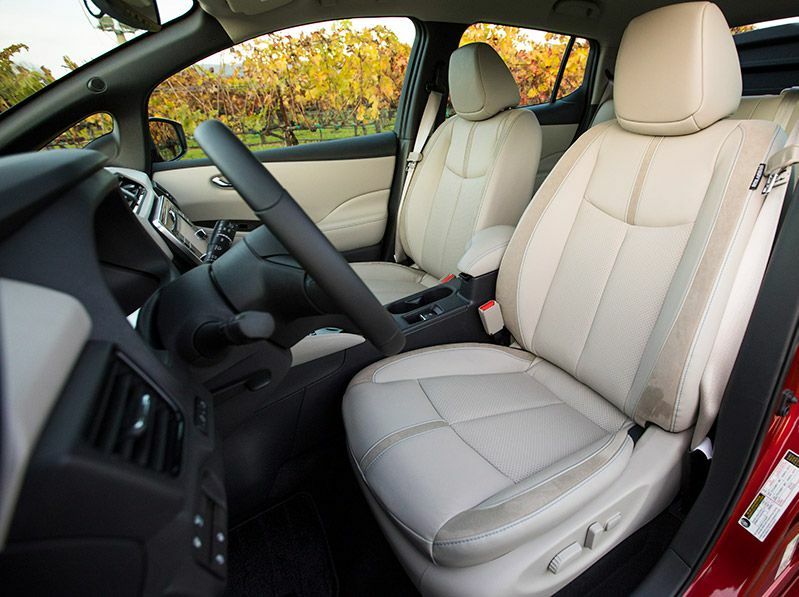 crossovers are dominating the automotive conversation these days partly because they offer a raised driving position that gives optimum outward vision, leading to a greater sense of safety. 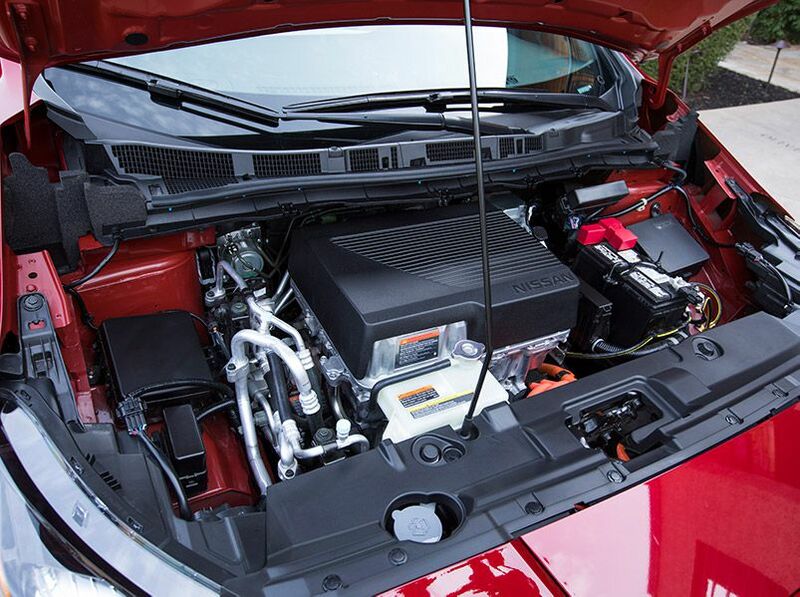 This plays into the hands of the Leaf’s designers, because they can lift what is essentially a compact hatchback and slide the battery in beneath the cabin’s floor. 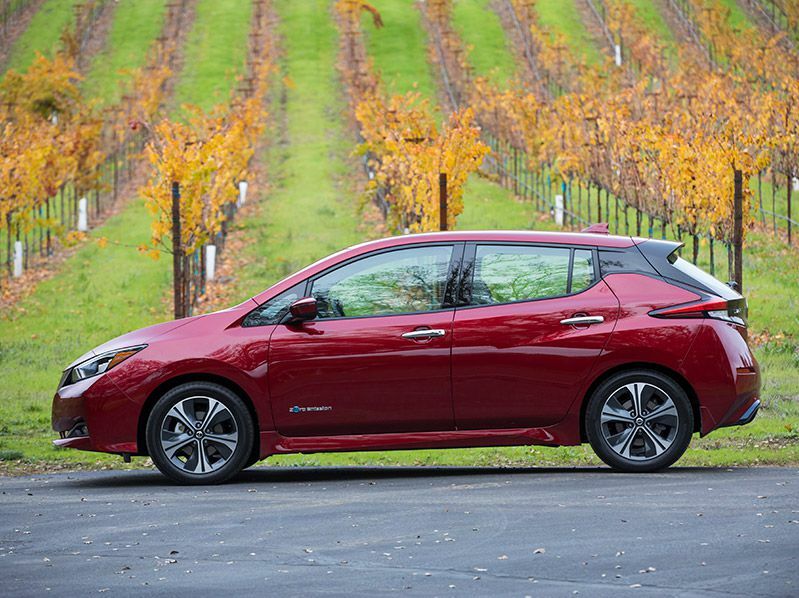 This second-generation Leaf has a design that’s more mainstream than its predecessor. It even has the “floating roof” rear pillar treatment found in the Nissan Maxima and Murano. Finding the ideal driving piston is hampered by the steering wheel only adjusting for tilt, not reach. Once the driver has achieved something acceptable, gets sort of used to it, and then becomes acclimatized to the little button that selects Park, Reverse, and Drive, the Leaf soon starts to be more likable. Passenger space is adequate for a compact car. With an adult male of average size up front, someone of similar build will be comfortable enough in the back. 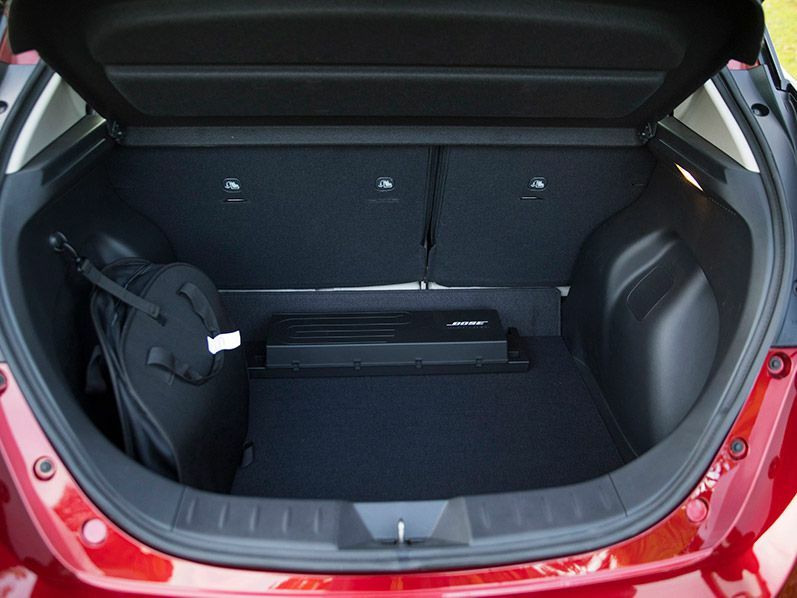 Cargo space behind the rear seat is 23.6 cubic feet. It splits and folds in the usual 60/40 way, and when both sections are down, the maximum cargo area is 30 cubic feet. That's not amazing, but it's useful. 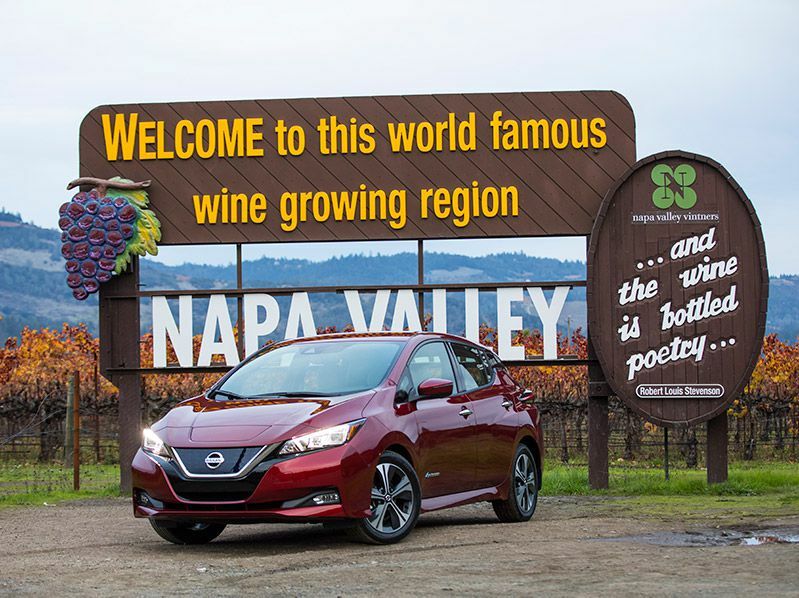 The Leaf’s suspension is pleasantly cushioned, not the least bit “thumpy.” This brings benefits on concrete-surfaced freeways as well as poorly maintained city roads. The Leaf is front-wheel drive only, so it tends to ease into understeer (where the front end goes wide) if a driver tries to take corners with too much enthusiasm. Up to that point (well, not a point exactly, more a predictable and easily controllable area), the driving experience is agreeable. 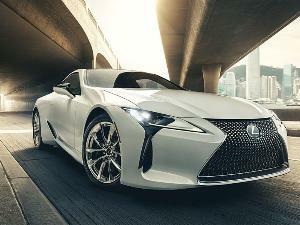 The steering feels easy — a bit light, but responsive and precise. And the body doesn’t lean too much through the bends. 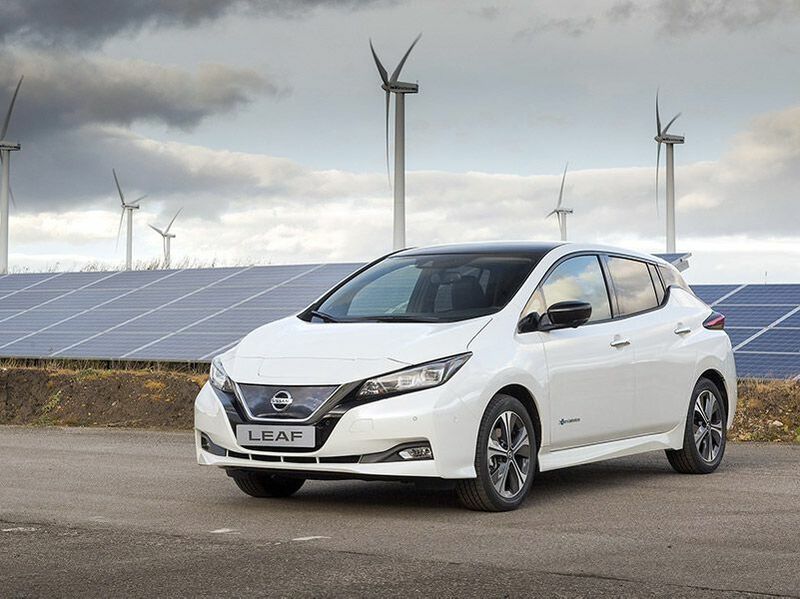 Like the majority of electric vehicles, the Leaf has most of its 236 lb-ft of torque (a healthy figure, by the way) available from standstill, so the car can zip away from the lights or dart into a traffic gap at a satisfying pace. But it can’t keep up that kind of power delivery when the speeds increase. Top speed is a claimed 95 mph, which is a bit beside the point for an eco-friendly vehicle, but at least it can stay with the freeway flow. 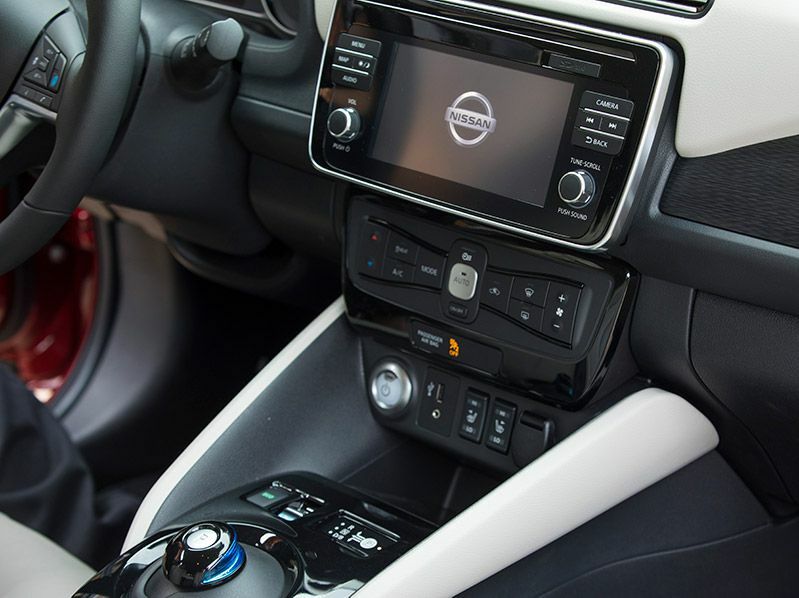 Nissan calls it the “e-Pedal” and it’s engaged by a switch in the center console. It increases the rate of regenerative braking (where energy is captured and sent to the battery). In practice, it means a driver can speed up or slow down just by pressing or lifting off the accelerator. It saves human energy by not having to dance between the two pedals. When the Leaf is in Eco mode and the e-Pedal is working, the rate of deceleration is abrupt, making it hard to drive smoothly. In Normal mode, though, it’s far more bearable. If this sounds intimidating to someone thinking of buying their first EV, don’t worry. It’s easy to get used to and soon becomes second nature. The Leaf is the best-selling EV in the world, so it’s doing plenty of things right. But there’s still a lot of thought that needs to happen before taking the plunge, such as what kind of trips the Leaf will be used for, what charging stations (if any) are available at the workplace or the mall parking lot, how the car can be charged at home. And so on. There’s still not quite the infrastructure or the range for a Leaf to be an only car, but as a second car that doesn’t contribute more emissions, the 2019 Nissan LEAF could be a fine choice.